Spanish archbishop; born at Burgos about 1351; died Aug. 29, 1435. His father, Isaac ha-Levi, had come from Aragon or Navarre to Burgos in the middle of the fourteenth century. Solomon ha-Levi was the wealthiest and most prominent Jew of the city, and was thoroughly conversant with the Talmud and rabbinical literature, officiating as rabbi of Burgos, and apparently filling the office of tax-farmer at the same time. His scholarship and intelligence, no less than his piety, won the praise of Isaac b. Sheshet, with whom he carried on a learned correspondence (Isaac b. Sheshet, Responsa, Nos. 183-192). On July 21, 1390, or, according to others, 1391, he was baptized at Burgos, taking the name Paul de Santa Maria. The motives of his conversion seem to have been ambition and vanity, although he himself alleged that he had been convinced by the works of Thomas Aquinas. At the same time his brothers Pedro Suarez and Alvar Garcia, and his children, one daughter and four sons, aged from three to twelve years, were baptized. His wife, Joanna, whom he had married in his twenty-sixth year, remained faithful to Judaism, dying in that faith in 1420; she was afterward buried in the Church of S. Pablo, built by her husband. 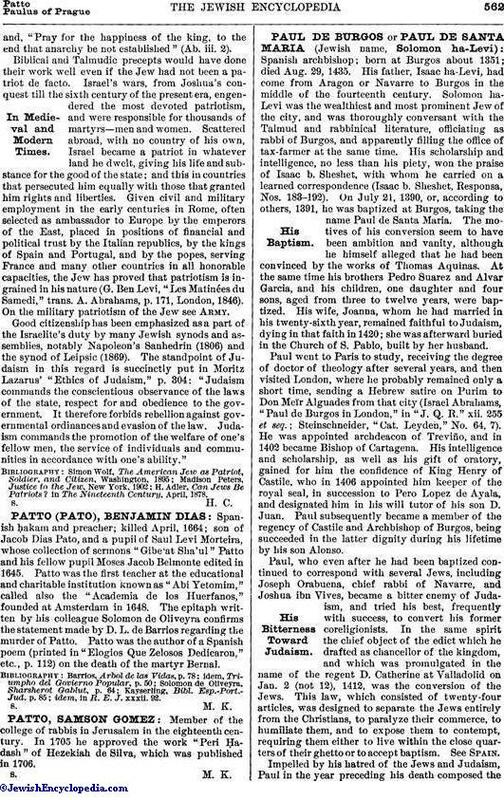 Paul went to Paris to study, receiving the degree of doctor of theology after several years, and then visited London, where he probably remained only a short time, sending a Hebrew satire on Purim to Don Meïr Alguades from that city (Israel Abrahams, "Paul de Burgos in London," in "J. Q. R." xii. 255 et seq. ; Steinschneider, "Cat. Leyden," No. 64, 7). He was appointed archdeacon of Treviño, and in 1402 became Bishop of Cartagena. His intelligence and scholarship, as well as his gift of oratory, gained for him the confidence of King Henry of Castile, who in 1406 appointed him keeper of the royal seal, in succession to Pero Lopez de Ayala, and designated him in his will tutor of his son D. Juan. Paul subsequently became a member of the regency of Castile and Archbishop of Burgos, being succeeded in the latter dignity during his lifetime by his son Alonso. Paul, who even after he had been baptized continued to correspond with several Jews, including Joseph Orabuena, chief rabbi of Navarre, and Joshua ibn Vives, became a bitter enemy of Judaism, and tried his best, frequently with success, to convert his former coreligionists. In the same spirit the chief object of the edict which he drafted as chancellor of the kingdom, and which was promulgated in the name of the regent D. Catherine at Valladolid on Jan. 2 (not 12), 1412, was the conversion of the Jews. This law, which consisted of twenty-four articles, was designed to separate the Jews entirely from the Christians, to paralyze their commerce, to humiliate them, and to expose them to contempt, requiring them either to live within the close quarters of their ghetto or to accept baptism. See Spain. 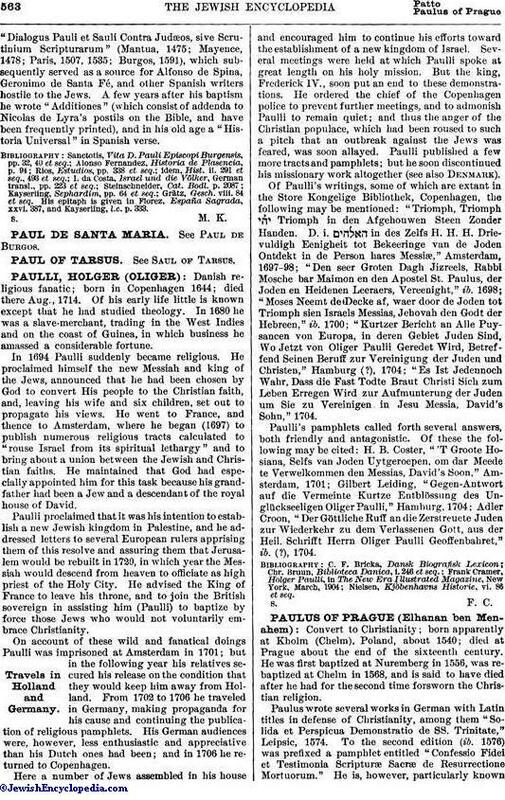 Impelled by his hatred of the Jews and Judaism, Paul in the year preceding his death composed the"Dialogus Pauli et Sauli Contra Judæos, sive Scrutinium Scripturarum" (Mantua, 1475; Mayence, 1478; Paris, 1507, 1535; Burgos, 1591), which subsequently served as a source for Alfonso de Spina, Geronimo de Santa Fé, and other Spanish writers hostile to the Jews. A few years after his baptism he wrote "Additiones" (which consist of addenda to Nicolas de Lyra's postils on the Bible, and have been frequently printed), and in his old age a "Historia Universal" in Spanish verse. Grätz, Gesch. viii. 84 et seq. His epitaph is given in Florez, España Sagrada, xxvi. 387, and Kayserling, l.c. p. 333.